Solara is a wireless indoor/outdoor Bluetooth speaker that features a solar charging panel. 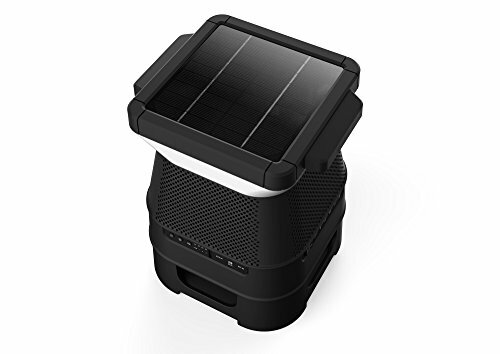 Sporting two LED panels with custom color, brightness, duration settings, and solar panels, the Solara Bluetooth speaker is an ideal companion for the outdoors: backyards, campsites, beaches and just about anywhere you can harness solar energy to keep the party going. The Solara speaker also utilizes EZ-Play technology, allowing it to connect with up to 8 other compatible speakers (including the Monster GLO, Tower of Music 1 & 2, etc.). 360-degree LED light• 360-degree LED lights illuminate the immediate area, with a variety of colors to choose from. Set light timers to turn off automatically, eliminate the risk of draining the speaker's battery.